Thoughts and Advice from an Old Cattleman, by Gordon Hazard D.V.M. This is one of the most useful books I have ever read about cattle ranching. Whether you are custom-grazing, raising stockers, or buying calves for grass finishing, this book has a treasure trove of important information about everything from how to manage the day-to-day grazing rotation, how to manage the health of cattle before, during, and after transport, as well as how to use a sell-buy business model to manage your farm finances when buying and selling cattle. If you raise cattle and are unfamiliar with sell-buy economics, then you owe it to yourself to read Gordon's book and learn how to use this powerful financial management strategy to your advantage. Enough said ... if you can find this gem of a book, pounce on it! From the Publisher: Dr. Hazard’s easy-going writing style makes it feel as though he is leaning on the fence, giving you ideas and advice right on the farm. After reading this book, you can see how a good business plan can be laid out. Dr. Hazard, at age 86, manages his 1800 steers on over 3000 acres with one part-time hired hand. His system has been developed to allow cattle, grass and time to do most of the work. He also explains and lays out the plan you need to prosper with stocker cattle, no matter the market. It’s a book that I find myself reading again and again. This book is not easy to find. It does periodically become available on Amazon via resellers (original suggested list price was US$24.99, so beware of some of the exorbitant prices asked by some resellers), however you may need to do a Google Search online for "Thoughts and Advice from an Old Cattleman" or "Gordon Hazard" to find other online book sellers*. Reviews for Thoughts and Advice from an Old Cattleman on Goodreads. 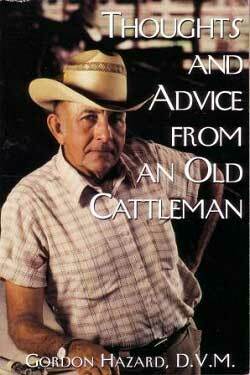 Have you read Thoughts and Advice from an Old Cattleman? Share your review in the Comments section below!